President Donald Trump said Saturday that his relationships with other Western leaders are perfect, but the truth is the transatlantic alliance has never been so split. 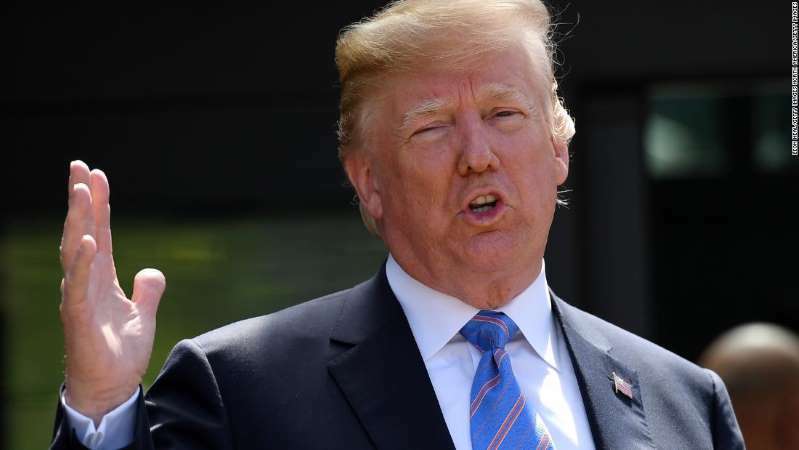 Trump angrily hit back at suggestions that he had thrown the West into turmoil at the G7 summit in Canada, branding a question over any downturn in relations as "fake news." Yet Trump showed up late and left early from a summit that highlighted gaping divides within the bloc of democratic industrialized nations that America nurtured. He insisted that the Quebec summit had been "tremendously, tremendously successful" despite accusing other nations of using the United States as a "piggy bank." Trump's early departure for Singapore, where he meets North Korean leader Kim Jong Un next week, showed his disdain for summit's Saturday afternoon discussion of climate change. And he cast doubt on the relevance of the summit itself, saying it would be more meaningful if Russia, which was kicked out of the G8 after annexing Crimea in a move seen as a grave threat by European powers, was let back into the grouping. But when he was asked about frustrations flying between him and other leaders like French President Emmanuel Macron and Canada's Prime Minister Justin Trudeau, he reacted angrily. "I would say the level of relationship is a 10. We have a great relationship. Angela (Merkel) and Emmanuel (Macron), Justin (Trudeau). I would say the relationship is a 10," Trump said. His anger was revealing of his operating method as President, his attitude towards America's traditional foreign policy positions and his skill in using theatrical moments on the world stage to send a strong message to his loyal voters back home. Trump's hyperbolic praise for a summit that was evidently discordant shows his refusal to allow any venture in which he is involved to be portrayed as anything other than a roaring success. It's far from the first time Trump has created an alternative reality that serves his political narrative. The President's comments also show how he views international diplomacy through the prism of personal connections with other leaders. This is a holdover from his days as a deal closing real estate executive. It also hints at his view that lavish receptions he has received in places like China and Saudi Arabia are signs of unusual respect for him personally, and thus, show US ties with such states have never been better. Trump's critics argue he is fixated on optics and risks falling prey to foreign states who use personal flattery as a way to get what they want from him on more meaningful issues. So while Macron, who winked at Trump when he turned up late for breakfast Saturday, and Trudeau and British Prime Minister Theresa May all may have been cordial towards him, that doesn't mean that they are not frustrated and perplexed at the same time. One senior European diplomat rejected Trump's 10-out-of-10 assessment. "He must mean there are 10 things on which we totally disagree. Or like the title of the movie, '10 Things I Hate About You,'" the diplomat told CNN's Michelle Kosinski. In the days before the summit, European leaders made no secret of the fact that there were fundamental disagreements with Trump, leading some observers to dub the summit the G6+1. "The American President may not mind being isolated, but neither do we mind signing a 6 country agreement if need be. Because these 6 countries represent values, they represent an economic market which has the weight of history behind it and which is now a true international force," Macron, who sources said also had a difficult call with Trump, tweeted on Thursday. Trudeau and Trump also had an acrimonious exchange over the phone over his decision to impose steel and aluminum tariffs on US allies, CNN has reported. And before he left for Quebec, Trump accused the European Union and Canada of treating the US "unfairly." And Chancellor Angela Merkel has made clear her disquiet with Trump's policies, arguing that Germany may no longer be able to rely on its US ally. Her spokesman Steffen Seibert tweeted a picture that seemed to capture the mood of the summit. Merkel, hands on a table, is leaning over the President who, seated, looks defiant, with his arms crossed, with national security adviser John Bolton peering over his shoulder. Macron is also engaging Trump -- while Japanese Prime Minister Shinzo Abe is standing with arms folded and with a resigned look on his face. Another view, tweeted by White House social media director Dan Scavino shows the same exchange but in a less tense moment, with some officials grinning. At their root, tensions between Trump and fellow leaders run deeper than personality. In European capitals, officials complain that the US President's populist nationalism and economic sovereignty arguments reject values that have bolstered the West since World War II. There have been tensions and trade spats before. In 2003, France and Germany broke with the United States in a bitter dispute over the US invasion of Iraq. But the West has never been so divided over ideology. And no US President has been so solicitous to the West's foes, like Russian President Vladimir Putin and China's President Xi Jinping, and treated America's partners as adversaries. Trump's faithfulness to his election promises on pulling out of the Paris climate deal and the Iran nuclear pact also caused splits with allies who believe both agreements are critical to their national security. Many Europeans view Trump's claim that climate change is a hoax, his policies on immigration, his racial and religious rhetoric and his "America First" ideology as antithetical to European values. Trump has frequently expressed disdain for the EU and was an enthusiastic cheerleader after Britain voted to leave the bloc. And he also has a sophisticated understanding of his own political interests -- and while critics chide him for tarnishing America's global image, he knows that his base loves to see him turning up at a summit and chiding liberal elites from Europe and elsewhere on trade. A year into his presidency, it is now clear that efforts by foreign leaders to manage and temper the unpredictable US leader have failed, and that he is who he said he would be. That leaves America's allies with a huge problem.